Dr. Gary Patronek is a veterinary epidemiologist who first encountered animal hoarding in the late 1980s while working as the director of a local SPCA (Society for the Prevention of Cruelty to Animals). Subsequently, as the Director of the Center for Animals and Public Policy (CAPP) of what is now the Cummings School of Veterinary Medicine at Tufts University, he founded the Hoarding of Animals Research Consortium (HARC), an interdisciplinary research group that has written the bulk of the existing scientific literature on animal hoarding. During his years as a Vice President at the Animal Rescue League of Boston, he was a co-editor and one of the authors of the Guidelines for Standards of Care in Animal Shelters published by the Association of Shelter Veterinarians and adopted by the Canadian Federation of Humane Societies in 2013. He is also a co-editor and author of several chapters in Animal Maltreatment: Forensic Mental Health Issues and Evaluations, published in 2015 by Oxford University Press. 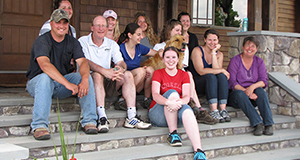 Now semi-retired, Dr. Patronek is an independent consultant, CAPP Faculty Fellow, and Adjunct Professor at Cummings School of Veterinary Medicine. He spends his free time cycling, kayaking and doing landscape photography.